UK opens Southeastern Conference play this weekend with a three-game series versus Tennessee. The Cats were projected to finish two spots ahead of Tennessee by the SEC coaches prior to the season, but the Volunteers have enjoyed a hot start to 2011. Tennessee is 15-2 on the season but has played just one game on the road and no games outside of Tennessee. The Vols are led on the mound by junior left-handed pitcher Steven Gruver, who is 3-0 with a 1.27 ERA in four starts. Senior infielder Khayyan Norfok is batting .492 with two home runs, 19 RBI and 17 runs scored on the season. Western Kentucky University will turn to senior right-handed pitcher Brian Edelen for its Sunday start in the Sun Belt Conference opening series versus Middle Tennessee. 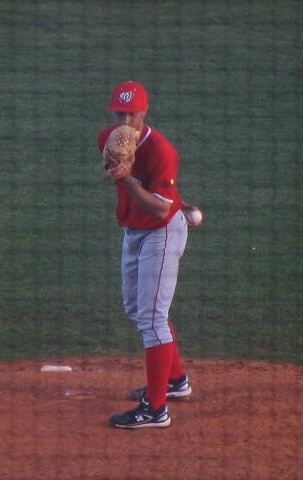 Edelen takes the place of sophomore right-handed pitcher Taylor Haydel, who has struggled in a weekend starting role. Edelen is 2-0 with a 4.66 ERA in eight games, including two midweek starts, this season. The Fisherville native has struck out 12 batters and walked six in 19 and one-third innings. Haydel is 1-1 with a 7.59 ERA on the season. The University of Louisville‘s pitching staff has carried the Cards to a 11-5 start to the season but its offense has done it no favors. The Cards boast a 3.33 ERA on the season but are batting just .241. Despite being six games over .500, UofL has scored just 63 runs on the season while surrendering 39. Just one UofL hitter is batting over .300 on the season. The Cards’ weekend starting pitchers are 7-1 with a 1.49 ERA in 12 games. Five Kentucky high school alumni are playing Kentucky colleges this weekend, headlined by Tennessee junior shortstop and PRP alum Zach Osborne. The Louisville native is batting .340 with one home run, nine RBI and 14 runs scored for the Volunteers this season. UofL will face Bishop Brossart alum Nate Mutsch, who has yet to surrender a run in five relief appearances for Xavier this season. Eastern Kentucky University will face a pair of Kentucky alumni in Indiana St. right-handed pitcher Blake Drake, an Eastern High School alum, and infielder Jon Hedges, an Owensboro High School alum. Drake is 0-2 with a 6.32 ERA in four games this season, and Hedges is batting .260 with two home runs, 10 RBI and six runs scored in 13 games. Finally, WKU will face Middle Tennessee outfielder Dalton Henzman, a LCA alum who is batting .214 in eight games.